Joan Sandoval is a Barcelonian creative coder interested in exploring the boundaries between technology, design and arts. 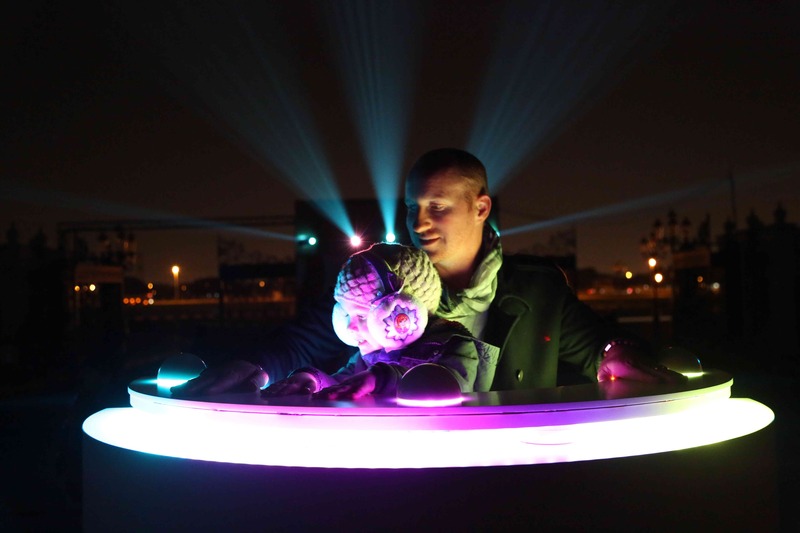 He has worked on projects spanning many disciplines including physical interfaces, performances, sound, video and light installations. Born in Barcelona in 1993, Joan Sandoval completed a Bachelor’s degree in Audiovisual Systems Engineering at Universitat Pompeu Fabra. During these studies, he discovered a great interest in programming, audio and arts. Therefore, he moved to Dublin to do a master’s degree in Music and Media Technologies at Trinity College Dublin. Since then, he has been collaborating with different studios, imagining, creating and delivering unique projects to artists, festivals and brands. SAY HI, DON’T BE SHY! Pablo Valbuena presents an original artwork in the hall of columns, a zone open to the public for the first time. 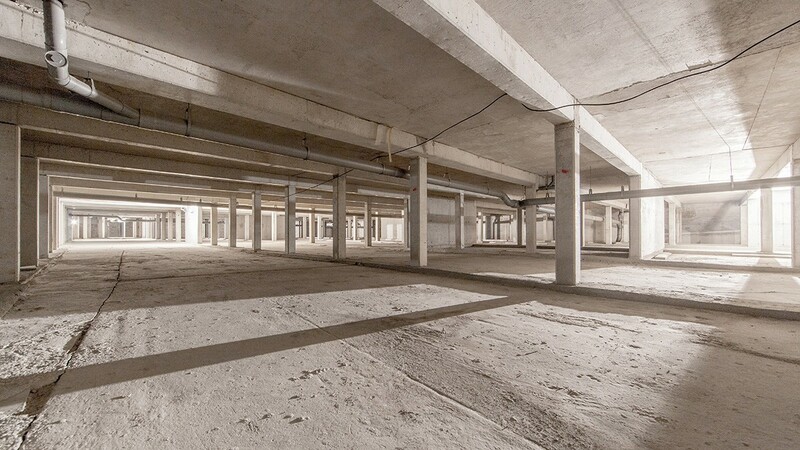 Kinematope [croisement] is a temporary, luminous, sonic intercession that reveals this underground space through a set of appearances and disappearances. 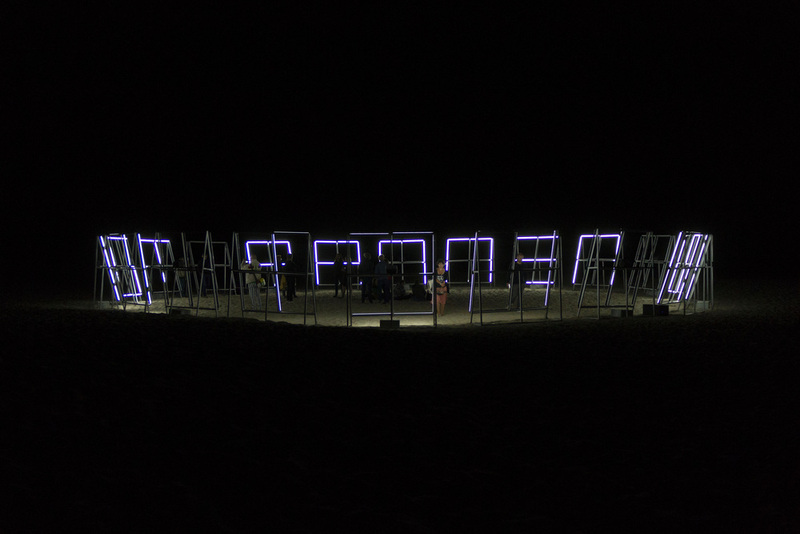 Over twenty minutes or so, the artist invites the public into an immersive experience, in time with moving light effects and sonic variations. For this project I was in charge of the audio side of the installation. More than 30 speakers needed to output different audible tones depending on each light intensity. 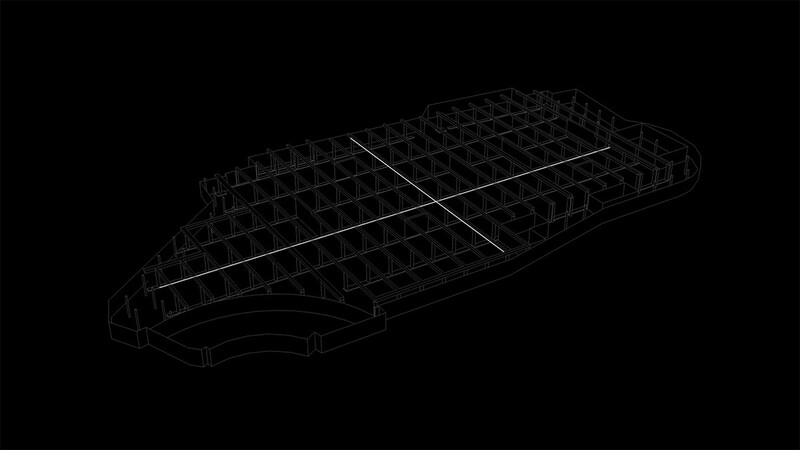 The Great Indecision Council is a large scale audiovisual installation that proposes to the audience an introspection to human intimacy. What are our interests? What are our REAL interests? We often secretly search on google things we are interested in or we would like to know. The installation combines data visualization of real-time Google searches with visual content and animataions designed by Tardy. I was in charge of collecting data from what people was searching on google in real-time. By using Google Trends API, web scraping and Google Cloud Text-to-Speech API we could reproduce with voice the real-time searches. 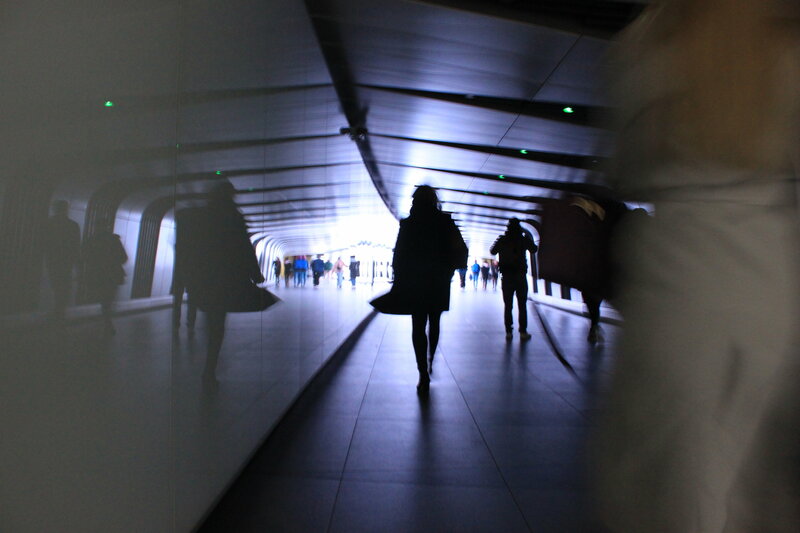 Upperground is a light installation that aims to recall the nature in a place where the user is most removed from it. 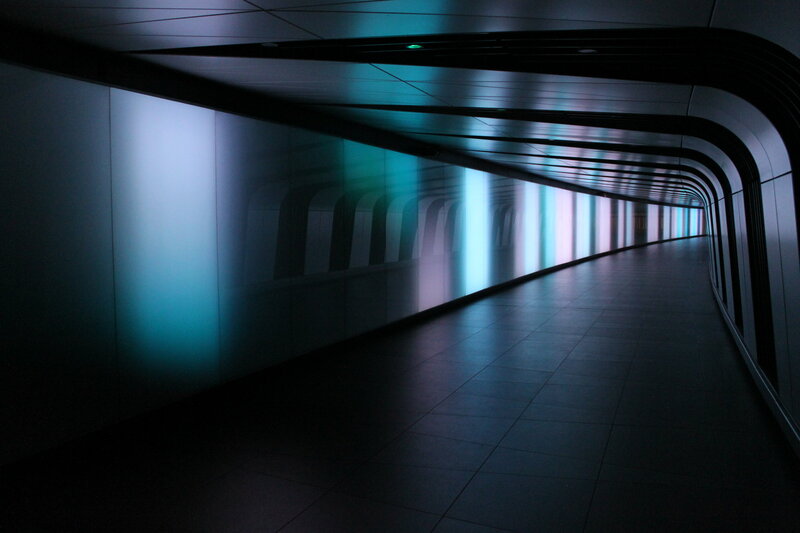 The lights in the tunnel are connected to the nearest natural park wind conditions and react to them in real time. 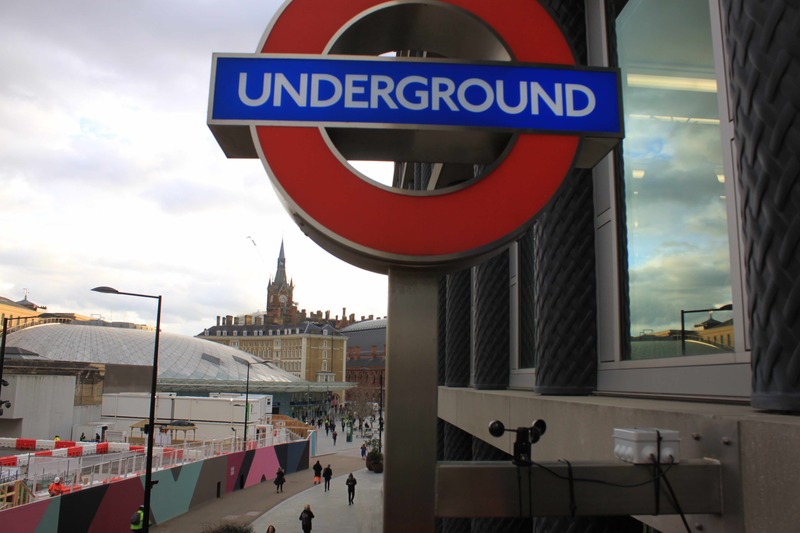 My work was to design and implement a weather station that would send remotely relevant data to the underground installation. Hand Coded Studio Team: Cyril Laurier, Maya Benainous and Joan Sandoval. Bitcoin is the most popular cryptocurrency worldwide that uses this technology. There are not a lot of transactions per second (around 3 tps), but Bitcoin processes more than $2 Billion worth of transactions per day! Most of the crypto-related topics are always something intangible, something you can not see or feel. Thus, it can be very difficult to understand what is happening. The main goal of this installation is to help to understand what is going on with cryptocurrencies, giving a focus on Bitcoin. How many transactions are being done right now? How much money is being transferred? From where? Transaction aims to solve these questions by representing real-time data from Bitcoin transactions in form of an audiovisual installation. During the one-week residency I developed the installation. Bitcoin real-time data is public, so I created a python script to extract the data and then send it to: Processing for the visuals, Arduino for the LEDs and Ableton (M4L) for the sound. 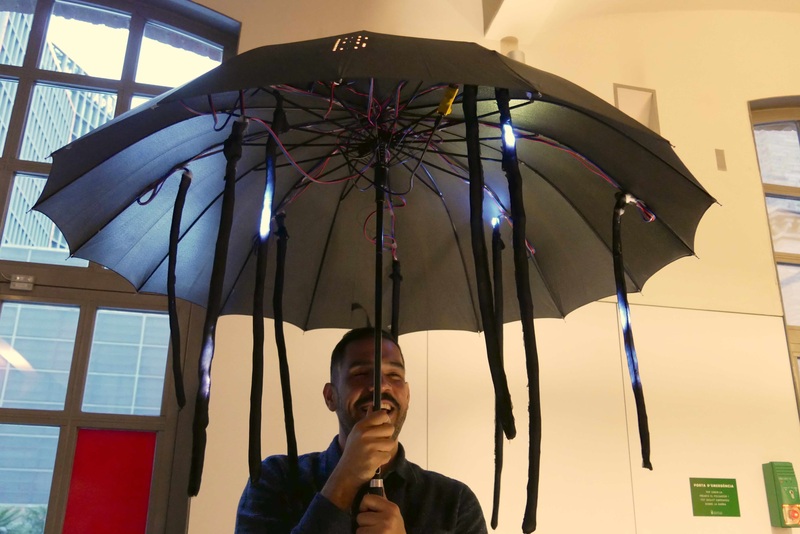 Make it Rain is a portable light installation that visualizes Bitcoin transactions in real-time. 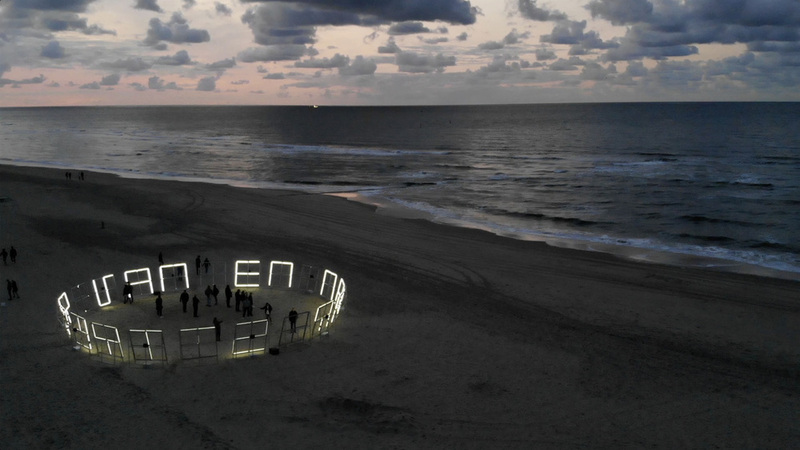 The installation received the Protopixel award from among 13 projects. I carried out the data collection from Bitcoin transactions and the reactive light animations. Team: Yannis Karavisilis, Anastasia Pistofidou and Joan Sandoval. 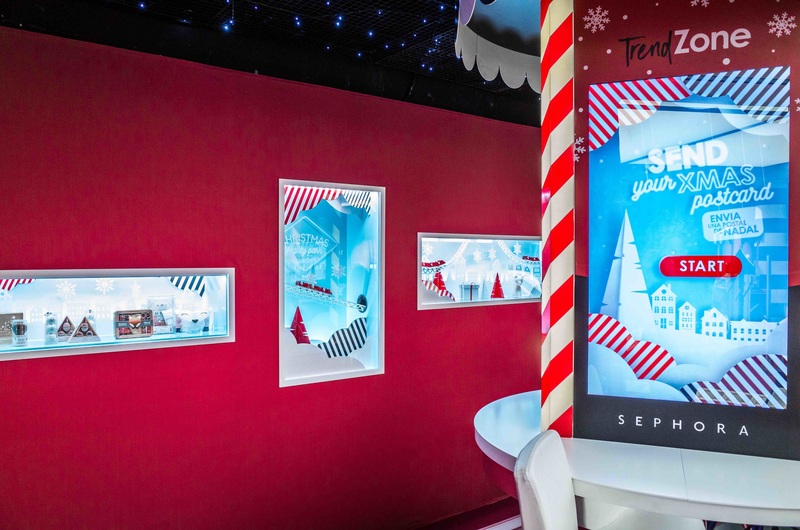 A new space was designed and developed for Sephora’s Christmas campaign. 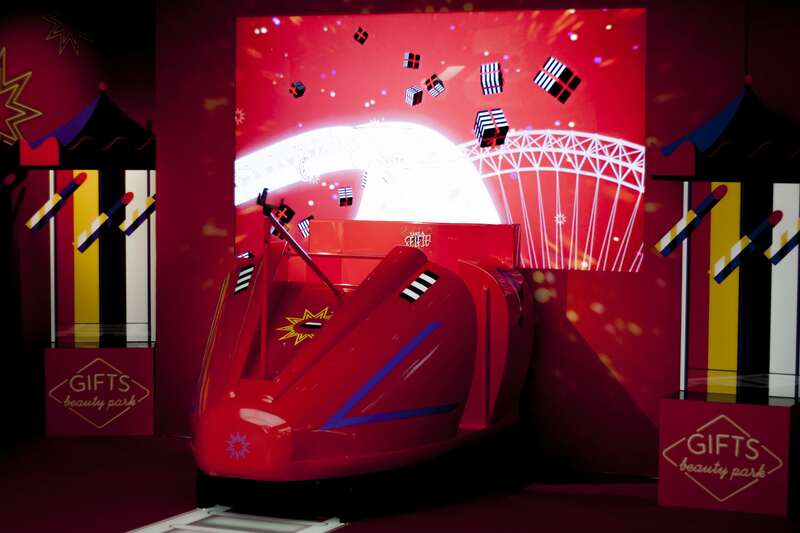 The area combined an unusual rollercoaster experience, a set of campaign-related miniatures and a Christmas postcard maker. I was in charge of developing the Christmas postcard maker application. The user was able to choose among different card designs, then write some Christmas wishes and send it to a friend. 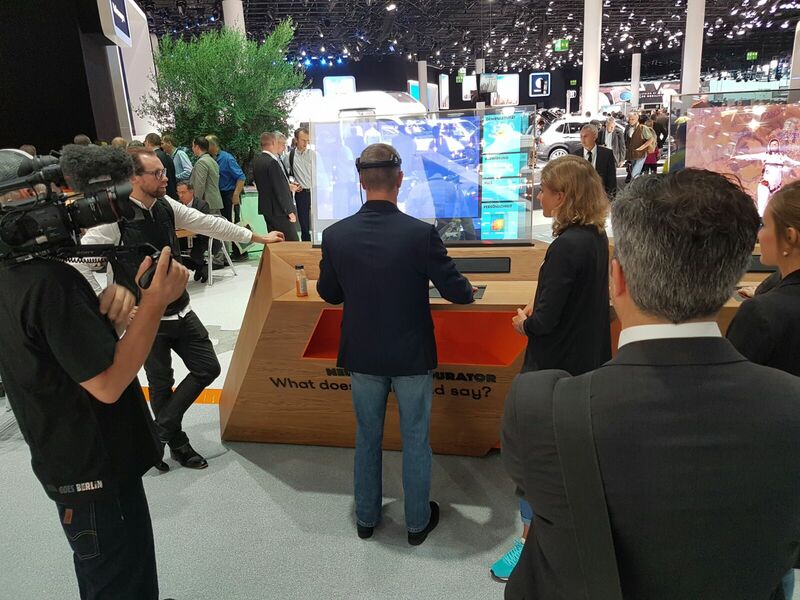 During the Frankfurt MotorShow SEAT wanted to develop high-tech interactive experiences for their booth. Along with a 4D experience with motorized chairs and VR headsets, another interactive experience called SEAT Neuro-Configurator was developed. Neuro-Configurator is a car configurator that chooses different car features such as engine, car upholstery,... based on user’s brain waves and heartbeat. I carried out the development of the experience, both the software and hardware side. In order to get the user’s brain waves a special headset from BitBrain Technologies was used, along with a heartbeat sensor. 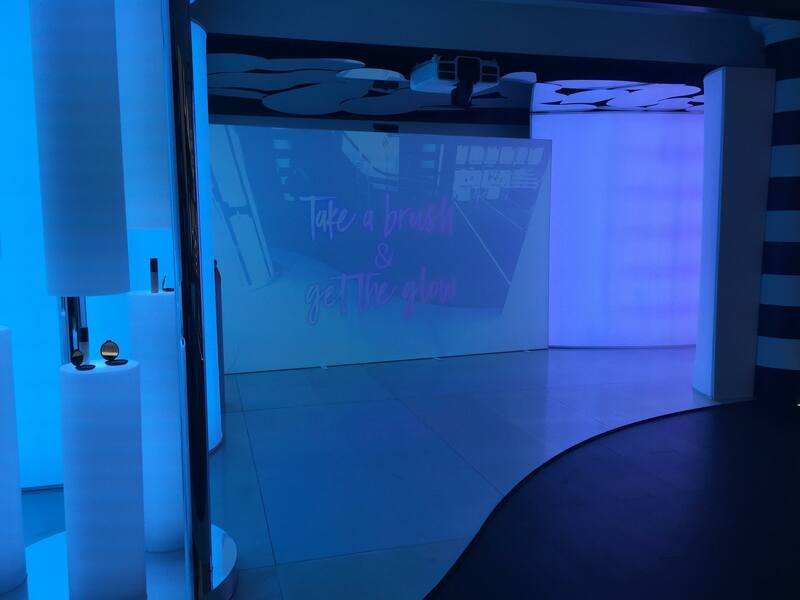 A new area inside the Sephora shop was designed and developed to consolidate Sephora flagship. The area combined augmented reality with a huge light installation. Body tracking, computer vision and a huge projector were necessary to create an interactive experience where you could draw with light in the air by just using make-up brushes. 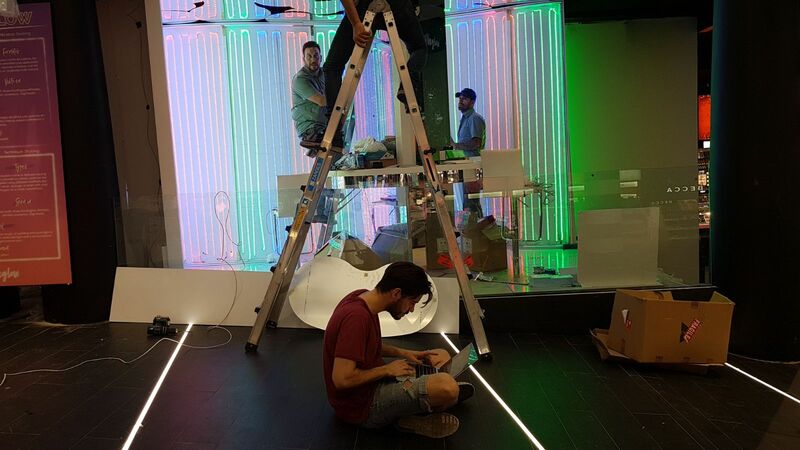 My role was to coordinate all the needs for the light installation, from contacting with suppliers to help with the physical installation. 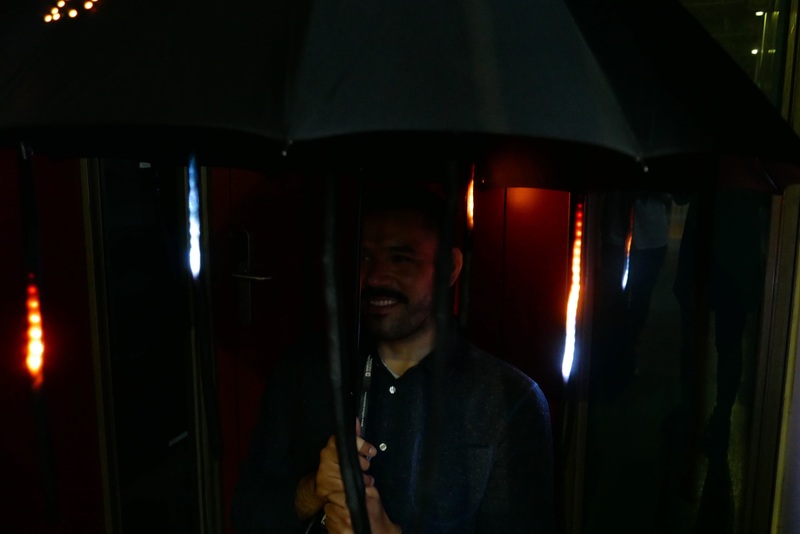 I also developed a software that controlled all the lightning (+15000 LEDs + spotlights) and was sending light color data to the AR installation. 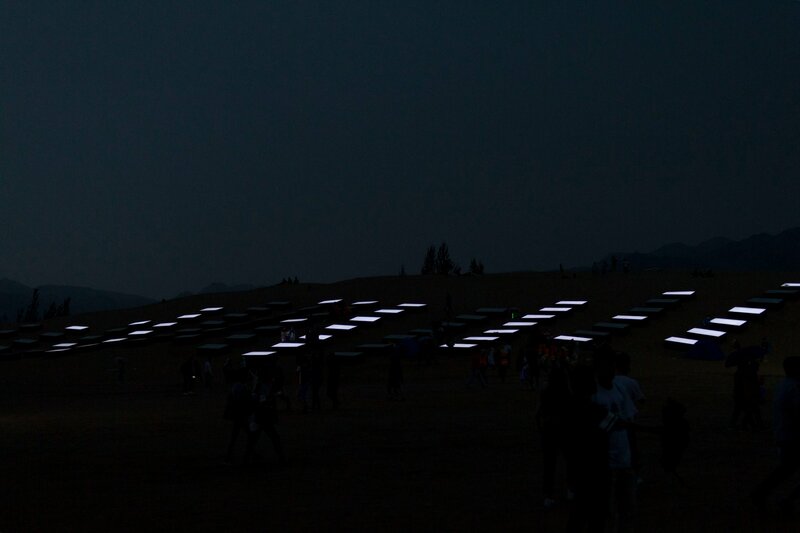 SAT is a large-scale visual, light and sound installation which during the day, its 72 modules act as mirrors reflecting the sky, and during the night the modules light up to create visual patterns. 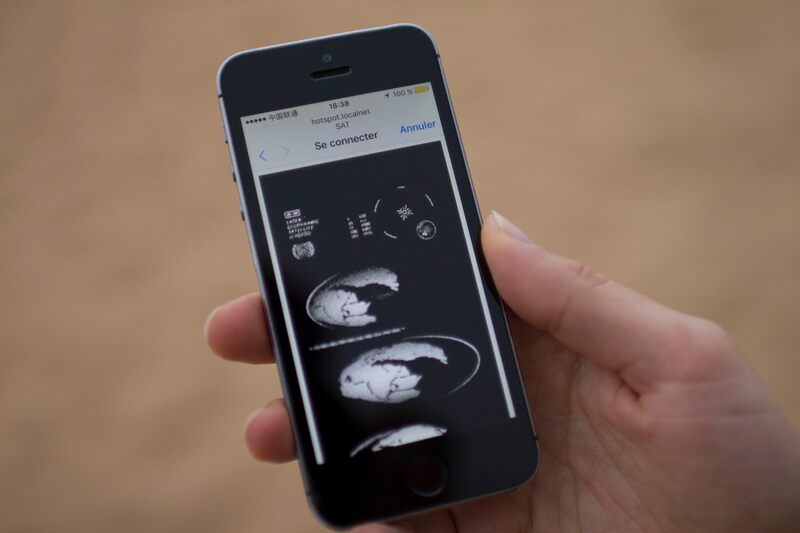 The visitors can connect to a local wifi network, and a message that was sent to outer space in the 70’s will be display on the phone screen. Also, the data exhange between the local server and the phone is visualised as a light sequence by the modules. I took part on the early stage of the project, creating a simple Ableton project structure for the sound designer, by using Max for Live. ALEA is a prototype based on artificial intelligence which aims to explore mechanisms of influence to disturb the automatisms in the social relations, and thus to challenge us in our relations with others. The system records the words of a group that discusses, then it analyzes and detect too predictable situations and repeats them at appropriate times. By the repetitive repetition of sentences, the device gives our words a different meaning by changing their context. I developed the software along with Hand Coded studio. Different libraries for speech feature extraction were used together with machine learing algorithms. 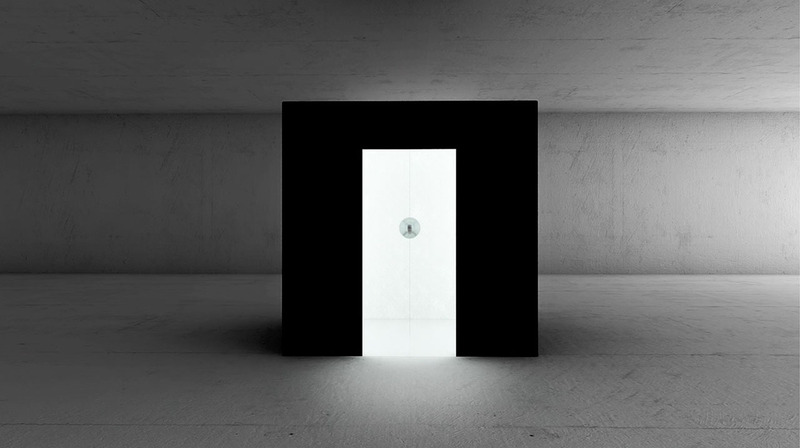 MAESTRO is a new interactive video mapping controlled by the user through a futuristic illuminated console. 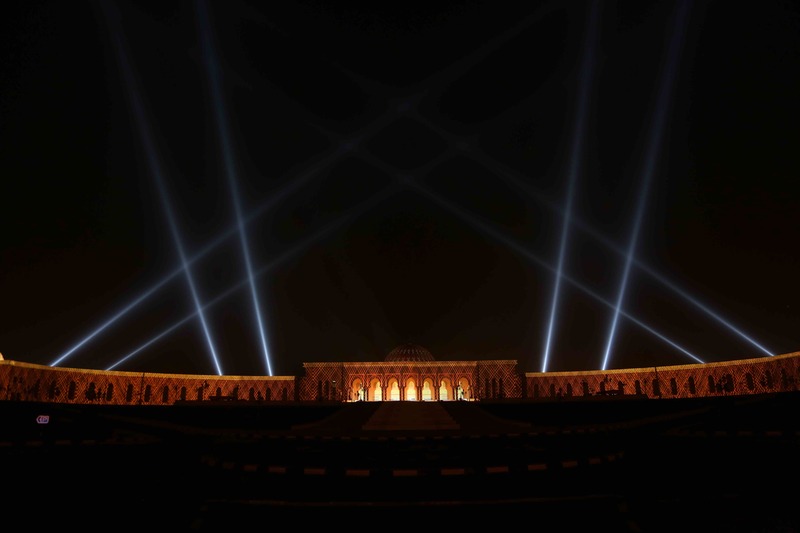 The installation took place on a half kilometer building, it needed 19 projectors of 20.000 lumens each. The users were offered to choose among different modes, where they could play with fluids and textures, shape and colour different Arabic patterns or play music through the console. For this project I was in charge of the audio interactive part. 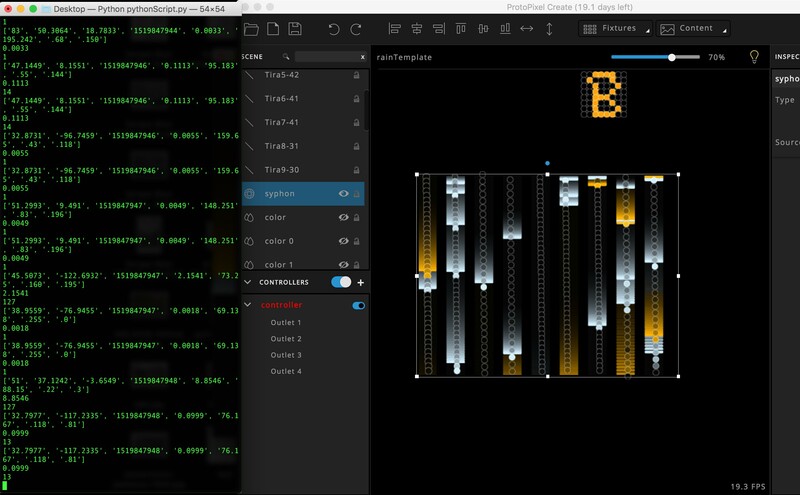 Different behaviours were created for each mode such as an audio generative piece, a musical instrument for painting or a music sampler with different DJ fx. All this resulted in a complex Ableton project with tons of tracks (+100), samples and Max Patches. 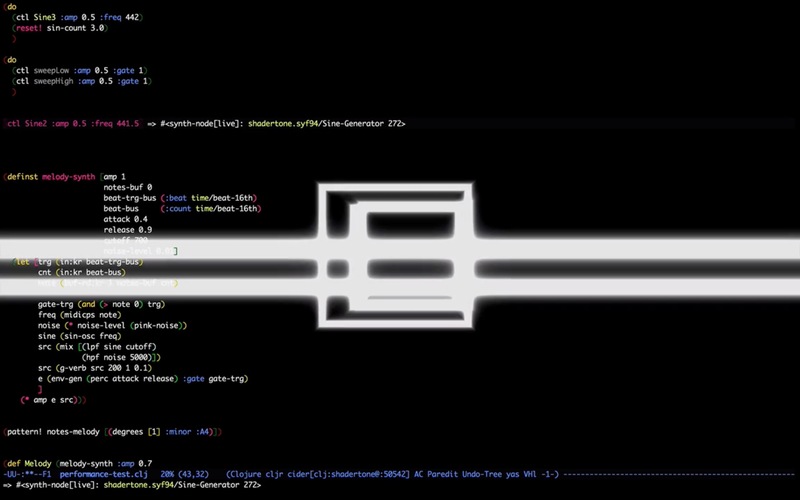 In high technical computer-based performances such as live coding, artists are able to create and modify music - sometimes also visuals - in real-time by typing code on their computers. This work aims to create a minimalist-based audio-visual live coding performance which explores cross modal perceptual analogies. 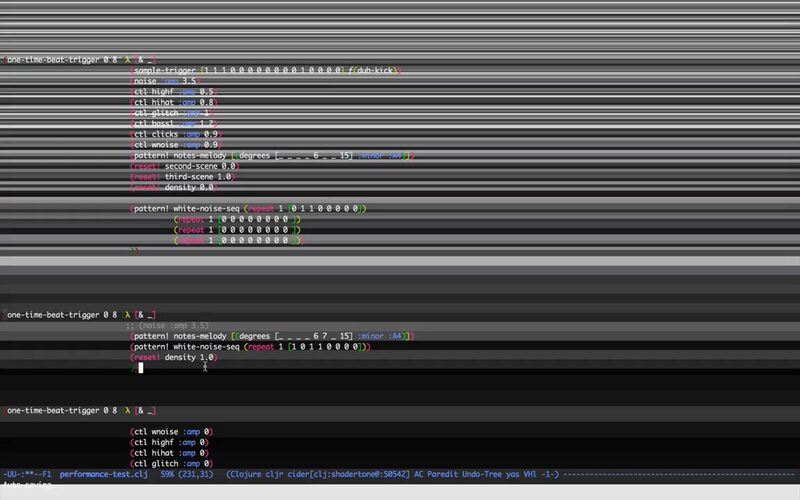 A review of minimalist works and visual music artists influence the final aesthetic, while the examination of different live coding performances and the review of contemporary live coding environments inform the system framework of the project. An analysis and discussion of the final piece and its performance is provided. Future directions are also discussed with a focus on performance improvement. People with motor disabilities often have difficulties in playing common musical instruments. Strumming with Stringpots (abbr. StrumPot) is a guitar MIDI controller, designed for a person that suffers from tetraparesis with Brown-Sequard syndrome. 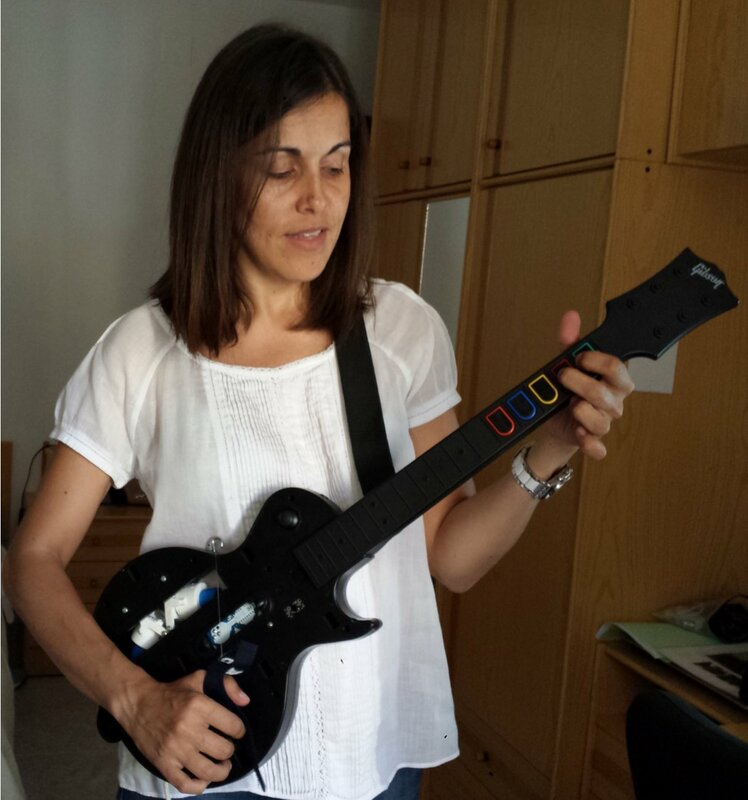 The controller has been built by modifying the gaming device “Guitar Hero”. An Arduino microcontroller board is used in order to manage all the data from all the sensors and send MIDI messages. 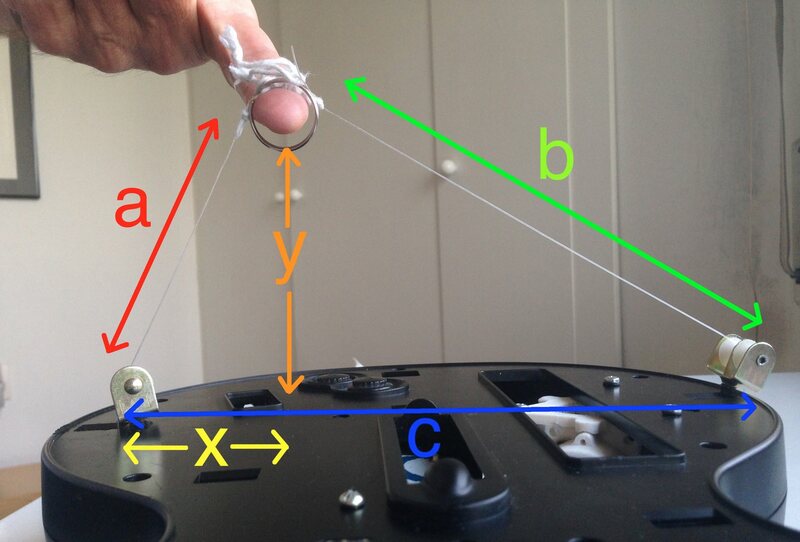 Two string potentiometers mounted on the guitar are used for tracking the 2D-position of the right hand of the user in front of the guitar. Six virtual strings are placed on the guitar. When the hand of the user crosses each of them, a midi note-on message is sent with the corresponding note number. 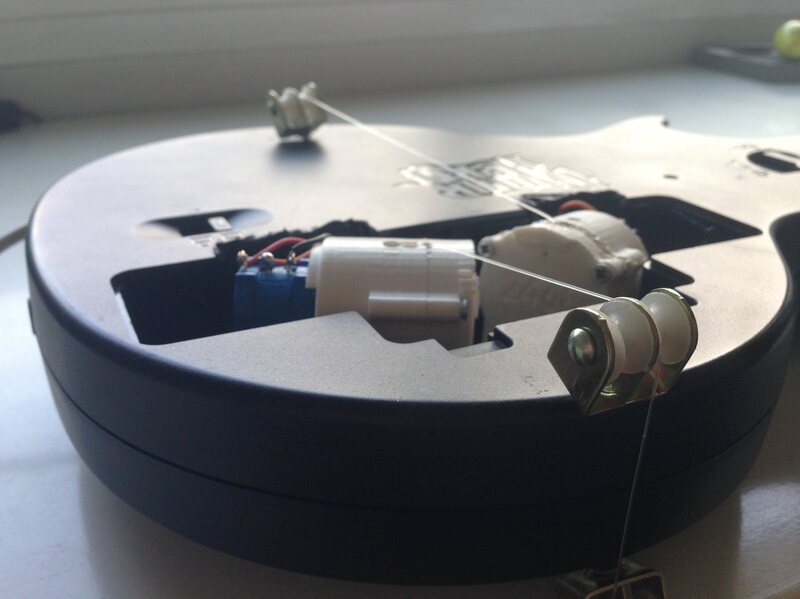 On the neck of the guitar the already built in buttons of the Guitar Hero device are used for changing the chords. The device is easy to use, low-weight and easy to transport anywhere.